Where in the world is the 3G Skype app? (Updated) | When Will Apple? On January 27th Apple updated their terms to allow 3G VoIP apps. With Skype’s official stance on the subject being they had the 3G version ready, everyone expected the new app to hit the virtual shelves within a couple days. 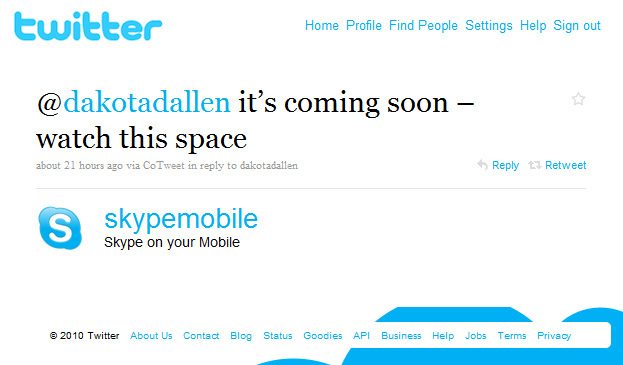 Then on February 3rd, when we all expected to download the 3G version to our iPhones, Skype said it would be delayed in order to get it right. Even though it seemed a bit suspicious since they were supposed to have the 3G version ready and waiting, everyone was just excited that VoIP over 3G was finally a reality. Here we are, 2 months later and still waiting. With no official word since February 3rd, the excitement has been replaced with frustration. Many people, myself included, are starting to wonder if the Skype – Verizon deal is the reason for the iPhone app delay. The deal with Verizon included exclusivity so Skype is not going to issue an update for the iPhone that will allow it to work over 3G. As plausible as this is, I doubt anyone from Skype would let this slip to a random person. I guess we’ll see what happens tomorrow after the Verizon Skype app is released. There’s no way I would have said that we’re backing away from iPhone, let alone not releasing a 3G-capable version, quite simply because it’s not true. We’re absolutely committed to the iPhone platform: I cannot emphasise this enough. We’ll be releasing the 3G-capable version of our app very soon indeed. As I continued my search, I found two official responses on the matter. Nikunj and others – I appreciate your patience. Unfortunately we don’t have any additional information to share right now. Our iPhone team is working hard to get the updated app ready to release – when it is, we will get it to you as soon as we can. So the official stance is basically the same as it was on February 3rd, we are are still working away and it should be coming soon. I’m not 100% satisfied with this response, but any response is better than none. At least we know they are still working on it…right? I’ve also contacted Skype PR for an official response, but not holding my breathe that they’ll respond. We can safely say that Skype for 3G will never come out.